"Mothers and daughters play a critical role in helping each other explore their infinite possibilities, despite the undermining influences of a world in which womanhood and motherhood are being corrupted and manipulated. 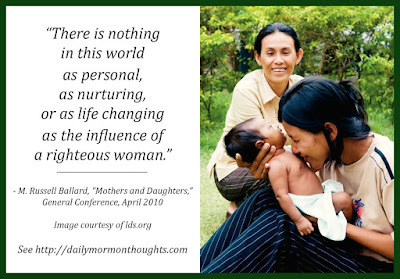 "Speaking to the women of the Church nearly a century ago, President Joseph F. Smith said: 'It is not for you to be led by the women of the world; it is for you to lead the ... women of the world, in everything that is praise-worthy, everything that is God-like, everything that is uplifting and ... purifying to the children of men' (Teachings of Presidents of the Church: Joseph F. Smith , 184). "Sisters, we, your brethren, cannot do what you were divinely designated to do from before the foundation of the world. We may try, but we cannot ever hope to replicate your unique gifts. There is nothing in this world as personal, as nurturing, or as life changing as the influence of a righteous woman." How sad to live in a world where, as Elder Ballard states, "womanhood and motherhood are being corrupted and manipulated." Satan is subtle in how he can cause decay and decline in our vision, sometimes in the name of equality and opportunity. I love the thought that righteous mothers and daughters can help reinforce one another as they "explore their infinite possibilities," and not just the temporal ones that Satan would point us towards. The quote from Joseph F. Smith is profound. Righteous women today must lead out and show the world what it is to be praiseworthy, uplifting, and God-like. And not only can righteous women make a profound difference in supporting one another, they also participate in works which have no equal; no man can match the loving, nurturing gifts of a daughter of God who understands her divine role and gifts.